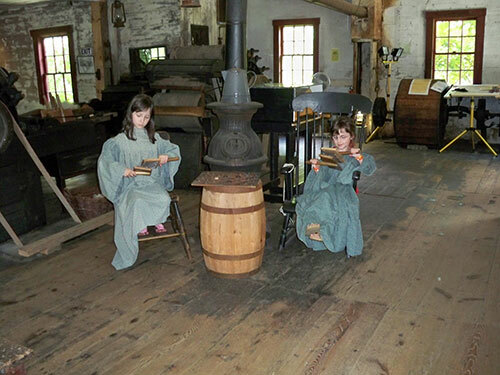 Wile Carding Mill Museum is open seasonally from June 1 to September 17. Two programs are offered to school groups. However, a program can be designed for your curriculum needs as required. This program provides children with the opportunity to learn the elements of preparing wool for the making of cloth. Hands on activities include loading a carder and rolling wool; spinning their wool on a hand spindle and lastly using their spun wool to hook a small piece. During the program children learn about how technology changed the community, and about the life and work of Wile Carding Mill employees. This program gives children the opportunity to see the water wheel in action to try their hand at carding wool and to see how the mill functioned. The tour will include the history of Bridgewater’s early development and industrial area, the life of families and how technology changed those lives in the community. Pre and post visit materials are available to teachers and group leaders as required. Any school or community groups interested in booking a visit can call (902) 543-8233 after June 1 or (902) 543-4033 before June 1 to arrange a date and time.